Stratton House Inn is available for family vacations; family and class reunions; church and worship retreats; business meetings; social gatherings; scrapbooking, stamping, and quilting retreats; and other functions. Stratton House Inn is about one hour west of Pittsburgh, two hours east of Columbus, two hours south of Cleveland, and two and one-half hours north of Charleston, WV. It is seven miles north of Interstate 70. 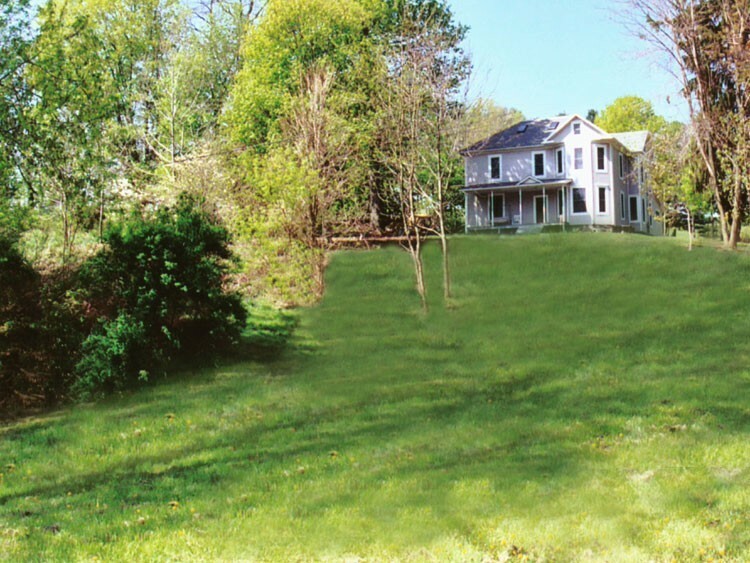 On eleven rolling acres, Stratton House Inn is located in Flushing, Ohio -- a "ridge" town in historic Belmont County, Ohio. To the north of Stratton House Inn, across Mill Road, is the historic Stratton Flour Mill -- from 1878 the source of quality baking flour used throughout the Ohio River Valley, and one of the first sources of self-rising pancake flour in the United States. Stratton House Inn was the home of two generations of Quaker millers -- and today their famous Whole-Wheat Self-Rising Pancake Flour is a special treat for all guests of Stratton House Inn. The home has been totally rebuilt and restored where possible. Today, it contains five bedrooms, four full baths, a modern kitchen, dining room, living room, parlor, sitting room, and office. Stratton House Inn is climate controlled with two furnaces and two air conditioning units. The dining room and living room are connected by a wide doorway, making it possible to use the two rooms together for meetings or dining. Stratton House Inn will accommodate up to 20-25 persons for meetings and conferences, and up to 12-14 for scrapbooking / stamping retreats. It will comfortably sleep 16 adults. 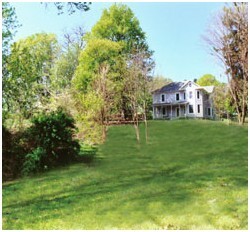 Stratton House has a high-speed internet connection and wireless network. Check your email from the front porch swing. A cable connection also is available for those who can't miss special TV programs or sports events. When seeking weekly rentals / vacation rentals in southeastern Ohio -- or special accommodations for your family reunion, school gathering, business meeting, or retreat -- this lovely, spacious, and comfortable inn will meet your needs and wishes. Captions: Top: Front view of Stratton House, after removing a huge maple tree that fell during a storm. Prior to this time, it was impossible to photograph the front of Stratton House because the maple tree totally concealed it. 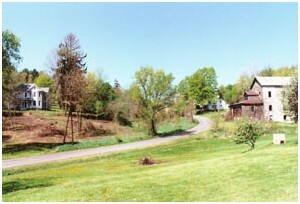 Bottom: View of both Stratton House and historic Stratton Mill. 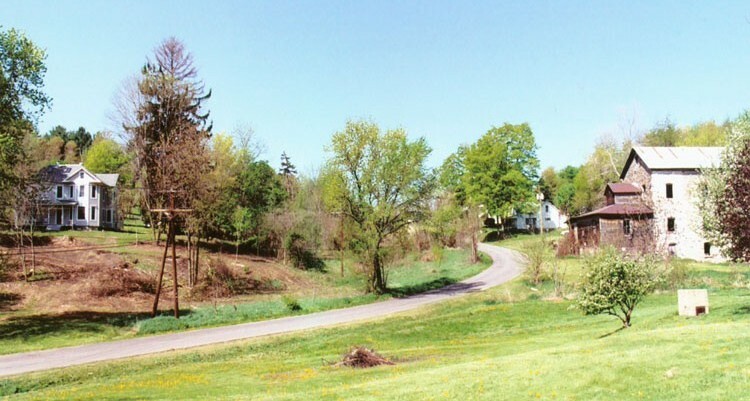 This photo is taken from the approximate location of the original Mill Stables. Click images for larger versions.